Hello, “Waryahs.” This week we continue the world’s introduction to The Ultimate Warrior. While breaking down these early promos, one can already tell that Vince McMahon had high hopes from the Warrior right out of the gate. How could he not? Outside of Hulkster and a few others, no one else had a “look” like Jim Helwig in early 1988. 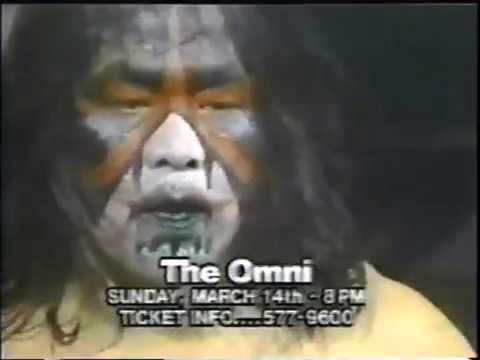 The “face paint era” of pro-wrestling was in full swing. 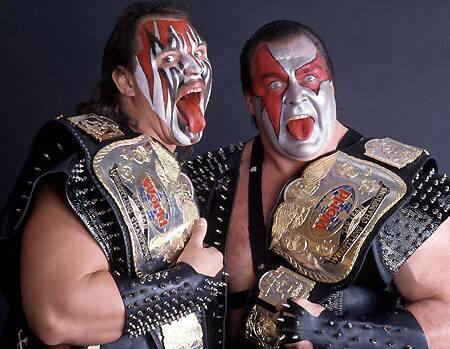 To this point, wrestling fans saw the likes of The Great Kabuki, Road Warriors, and Demolition—all talents that dawned their own brand of paint which made them stand out. 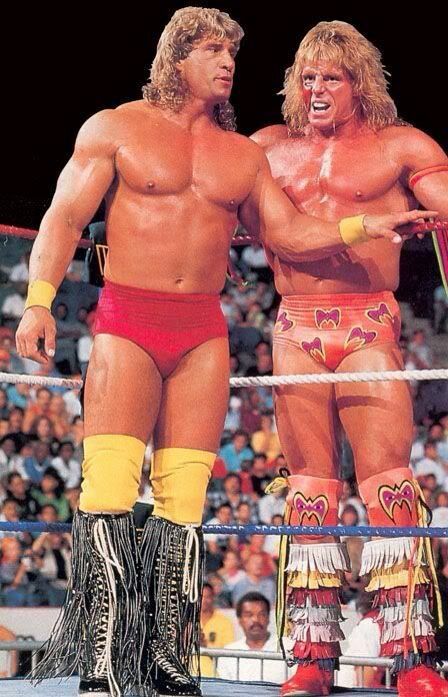 Hawk and Animal were two men who not only had an intimidating disposition but also were physical specimens to boot. They were two big dudes who could rap about being the baddest men on the planet and we as fans believed every word. 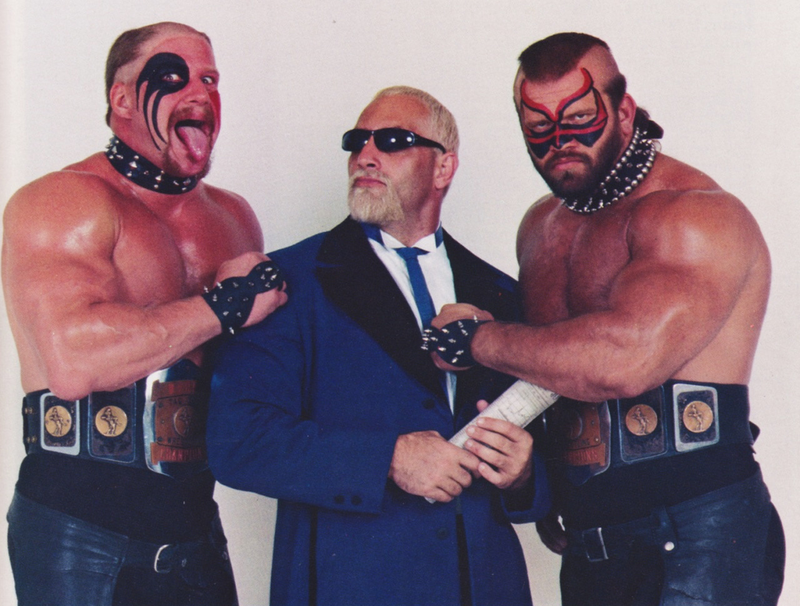 The difference between them and The Ultimate Warrior was the fact that Paul Ellering served at the Road Warriors’ manager. Often times in promo work, Hawk and Animal would knock it out of the park then leave it to “Precious” Paul to remind us that’s he’s smarter than us all. If you watch old LOD interviews, it would usually bounce from Animal, to Hawk, and then and Ellering conclusion. They all fed off of each other (as well as “danger” and “death”). In the beginning of Warrior’s run in the WWE(F), the interview of focus today was something that WWF producers thought necessary to get Warrior over to the masses—as this applied to a lot of the talent. Moving forward, Warrior wasn’t a wrestler that was going to deliver a “5-star” affair in the ring. It would soon be up to whoever had the task of working with Warrior to help those matches get over. That didn’t necessarily work for promos though. You needed to sell the folks on an eventually mediocre match. Today’s interview is an example of something Ultimate Warrior—like many upcoming prospects—needed to survive in his early stages. Who better than “Mean” Gene Okerlund to help set up the Warrior’s eventual success? Last two weeks gave us Warrior simply promoting himself and upcoming matches. 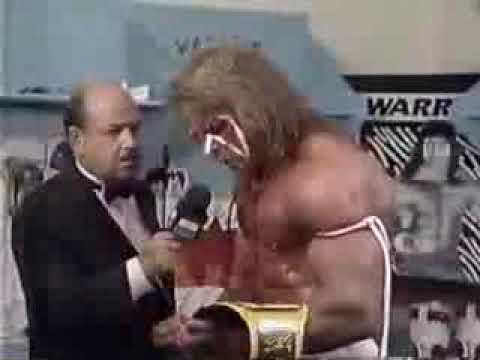 Okerlund brings the “who’s” and the “why’s” to the surface of The Ultimate Warrior in the following interview. Gene Okerlund has a voice that draws the attention of wrestling fans. As I mentioned last week, 1988 saw the end of the interviewer supporting the interviewee in pre-taped promos. Rather than the following interview focusing on a specific show coming up on the schedule, “Mean” Gene presents The Ultimate Warrior as new, up and coming WWF Superstar. His introduction is about all a little kid needs to hear in order to understand that Okerlund’s next guest’s success is on the horizon. Eventually, when these two were involved in pre-taped promos during Pay Per Views and Saturday Night’s Main Event, Warrior controlled the pace of those interviews. However, as this is one of the first one-on-one conversations between the two, Geno feeds Ultimate Warrior information to build upon. Warrior enters the shot looking a bit spacey, as if he’s searching for his words already. Again, Warrior’s look and rap is still developing. The “Ultimate Warrior blueprint” is a mere sketch, but as his confidence grows, you’ll soon see his appearances and promos become more defined. The overall “Philosophy of The Ultimate Warrior” is a little ways away. However, one could take this intro as a reference to the few others at the time who were also using the word “Warrior” in their name or moniker (i.e. “The Modern Day Warrior” or The Road Warriors). Thus, to get to this point Ultimate Warrior previously left all others claiming to be a “warrior” in the dirt. What does that make this “warrior?” Ultimate. Now, that was kind of stupid. Hercules was a big dude, but by no means did he have the physicality where opponents couldn’t “move” him. I get it, Ultimate Warrior puts over the size of Hercules and the possible challenge ahead but I think even Warrior himself thought what he said was kind of silly. So, he steps on “Mean” Gene’s toes a bit. This is interesting. I almost feel like this is what Vince McMahon and other producers wanted to see early on. Gene opens a window for Warrior. There weren’t any scripts for these types of promos back then. All they needed to hear were three words from Warrior: FEEL THE POWER. Not a lot of babyfaces had a catchphrase outside of Hulkster and Macho Man. I always attribute those three words to Ultimate Warrior. “ALWAYS BELIEVE!” was something that I think Warrior would throw on autographed 8×10’s and somehow WWF eventually took that as his catchphrase. (Either that, or, Helwig may have trademarked “Feel the Power” later on preventing WWE from using it for promotion.) A few years later, WWF would tell viewers to “Feel the Power of the World Wrestling Federation when it comes near you!” If they tried to sell, “Always believe in the World Wrestling Federation,” they wouldn’t be keeping it Kayfabe. Warrior delivers the aforementioned catchphrase when he says, “In 1988, I’m looking to pull all the Warriors out there that are WWF fans—makin’ ‘em Warriors, makin’ ‘em FEEL THE POWER of the Ultimate Warrior and coming down the road with me. The road to success! The road to greatness! That’s where The Ultimate Warrior’s headed and you better believe it! To this point, the “who,” “where,” and “what” have now been covered by both men. To close out this interview, “Mean” Gene tackles the “why?”. “Many different colors and many different personalities,” has to be one of the first quotes Warrior produced where you now wonder if Warrior had something in mind for his character. I honestly think this is just one of those things that I over-analyze when I’m considering Warrior to have more forethought that he actually had. Given his body of work, this explanation about his facepaint is sort of profound. We would eventually see many different colors and a few personality changes in the next few years. I know Jim Helwig’s backstage attitude changed as Warrior’s popularity grew. Again, this is me looking further into Warrior’s words. Either way, it is interesting nonetheless. I also love how this interview is a shining example of a stereotypical pro-wrestling interview of this era. Warrior’s bellowing, “BAAHHHHH!” at the end is the exclamation point in his own animalistic way. I love that. He wasn’t lying. It’s been over thirty years since this interview premiered on Superstars of Wrestling and here I am blogging about the lasting effects. This is fun. NEXT WEEK: The first part in a series of promos dedicated to The Ultimate Warrior’s showdown with Hercules at Wrestlemania IV! Get ready as I double-up for the next few weeks and examine the first of a couple Warrior feuds that looked great on paper but totally failed to deliver in the ring. Matt de Simone is a writer, podcast host, and procurer of pop culture. Follow him on Twitter, Instagram, and check out a few “back issues” of his soon-to-be-returning podcast!